Herbal Medicine is the oldest form of medicine in the world, used by people of all cultures. There is currently a reawakening towards discovering again the roots of wisdom-based traditions of medicine. 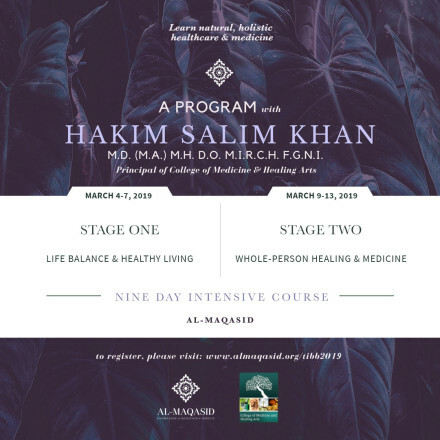 College of Medicine and Healing Arts' Diploma in Herbal & Naturopathic Medicine (Unani Tibb) is a synthesis of ancient Hippocratic and Near-Eastern traditions. This programme is for those who wish to learn and practice an authentic and comprehensive tradition relevant to dealing with today's health challenges. It incorporates relevant modern knowledge and techniques where appropriate towards revival of the Tibb tradition. Each student gets personalised attention. They are expected to work on their own self-development (a motto which runs throughout the course is 'physician, heal thyself'). There are also assignments (written and practical), and supervised clinical practice. Full Assessment Criteria are available on request. The Diploma will be awarded upon successful completion of all of this. Our Diploma programme is accredited by IANM (International Association of Natural Medicine). Graduates are eligible to join IANM, and obtain a practitioner's licence and insurance to practice within current USA legislation. The inner secrets of creating a balanced lifestyle with the six essential factors. Learn the origin, evolution and treatment of chronic degenerative diseases of our time. Learn whole-person nutrition and how to individualise for each person. Be introduced to the rich treasures of the Tibb materia medica. Learn the relationship between toxicity, diseases and detoxification. Learn the inner workings of human beings and how to facilitate healing. Be introduced to the practical art of herbal medicine. Eventually set up your own practice either as a herbalist, nutritionist, a well-being counsellor, personal health coach or advisor. Helps you to empower others to establish positive health, and prevent becoming a victim of chronic disease. Join an international network of natural therapists and educators. Continuing support after you graduate. M.D (M.A.) M.H. D.O. M.I.R.C.H. F.G.N.I. 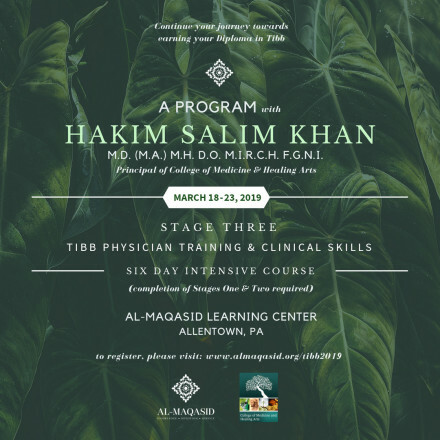 Hakim Salim has been in practice and teaching for 40 years. He established Mohsin Health Clinic in 1978 in Leicester, UK, where he continues to practice, seeing patients from various backgrounds and locations. He also founded College of Medicine and Healing Arts, to provide education and training in Tibb (whole-person medicine), and CAM (Complementary and Alternative Medicine). We are not able to offer on-site accommodations. We recommend that you arrange lodging at one of the nearby hotels. Unfortunately we are not able to offer child care during this program.